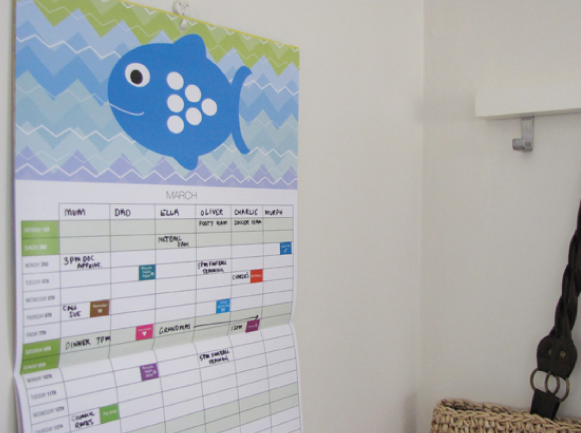 It’s time for a giveaway, there are 10 x 2014 Family Organiser Calendars to win! Valued at $25 each! Tomfo is more than a calendar, it will help you organise your life so you can get on with doing all the things you love! It features a 6 column grid and has space to write what everyone is doing at-a-glance for each month! You can keep track of busy schedules and jot them down so everyone knows what’s going on and when. It’s the perfect family calendar. Simply scroll down and enter via the Rafflecopter form below. I’m already getting dates for January so it’s great to have one handy to put down those events for 2014! (If you do win one, it make s a fab christmas present, you’re friend will love you forever, promise!) Why not check out the shop, there are some other organising products you might love there too? To enter complete the Rafflcopter form below and answer this question…. What does Tomfo mean and how would it help your family get organised for 2014? Need a hint? I’t’s part of our logo up the top left. 1. Only Australian residents are eligible to enter. 2.There 10 Tomfo calendars as above. 3. Entries – Open 16/10/2013 1 pm – Close 20/11/2013 1pm AEST. The winner will be notified by email, and then posted on the rafflecopter form above. 4. The Prize is not transferable, changeable or redeemable for cash. 5. Prizes sent out will not be replaced in the event that they are stolen, lost or damaged in transit. To view the complete terms and conditions click the Terms and Conditions tab on the Rafflecopter widget above. « My new vertical garden inside – I’ve got an Urbio!